Prince Ferdinand was in command of the British, Hanoverian and Prussian army that defeated the French at the Battle of Minden, on the 1st August 1759. 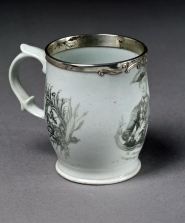 The source of the print of Prince Ferdinand seen on this mug was most likely this engraving, published in the London Magazine in 1758. Another view of the mug, showing the typical Longton Hall handle. The mug has been fitted with a silver rim of rococo form. This Longton Hall porcelain mug is printed with a portrait entitled "The Illustrious Prince / FERDINAND of BRUNSWICK" and the print is signed "Sadler Lipl." for John Sadler the Liverpool printer. To one side is a print of a battle scene and to the other a shield with the arms of Prussia surmounted by weapons and flags, one of which is inscribed "Minden".